Over the past few years, Google has remained among some of the largest tech organizations in the world. We have even witnessed this global brand provide funding to a ton of innovative startups and help them grow to their true caliber. And guess what, Google is back at it again! And this time, it's all about empowering the Web and mobile app developers with the help of a new hashtag called ‘I Make Apps’ i.e. #IMakeApps. This hashtag is trending all over the Internet and app developers from all over the globe are coming forward with their stories. Social media platforms like Twitter, Instagram and Facebook are playing their part adequately by making this trend go viral. With this creative Google’s #IMakeApps campaign, android app developers are speaking out about their dreams and aspirations while building mobile apps and gaming applications. How To Get Featured in #IMakeApp Campaign? From app developers to company founders and from product managers to app designers, everyone is eligible to be part of this movement. The main objective of this Google campaign is to motivate android developers and other technical professionals to come forward and talk about their passion. And we too completely support this #IMakeApps campaigns that is why we are sharing some information on how you can get featured by Google too. The process is simple and very easy, all you need to do is self-nominate yourself using the #IMakeApps hashtag on your social media accounts and share the app or mobile game that you have developed or designed and what is your actual personality outside your work life. "The Android developer ecosystem is made up of exceptional individuals with different backgrounds, interests, and dreams. To celebrate the people who make up our community, starting today and over the coming months, we’ll be meeting with developers, founders, product managers, designers and others from around the world to hear more about their passions and discover what they do when they step away from their computers." “When I started working with neon lights I became colorful too; now I can also channel this positivity to football fans worldwide through my creative work at the Forza Football App." Josefin Eklund is a self-proclaimed junkie who is addicted to neon lights. It all started as a curiosity for documenting different types of neon pieces she found on her travels. This interaction later turned into her passion for designing her own light-filled installations and exhibiting those bright creations in European cities. Until now Josefin has successfully exhibited her unique art in four European cities in just a few years. At the age of 29, Gregory Veret decided to go back to school and learn everything he needs to know about agriculture and organic farming. Then after some time, he bought a 65-acre island to start his very own organic farm. Gregory was able to keep his farming passion a secret for quite a few years, but now with #IMakeApps, he is coming forward to tell us his story. “Visualfy is an app for deaf people but I don’t think I’m helping anyone. I think it's a basic right. I can’t conceive a world that is not for everyone". 2008 was the year when Manel Alcaide first started performing aerial acrobatics and decided to follow his true passion. Since then, he has hosted various integration workshops for deaf and hearing children. His motive behind these workshops was to bring the children together through the means of circus techniques. So, what are you waiting for? 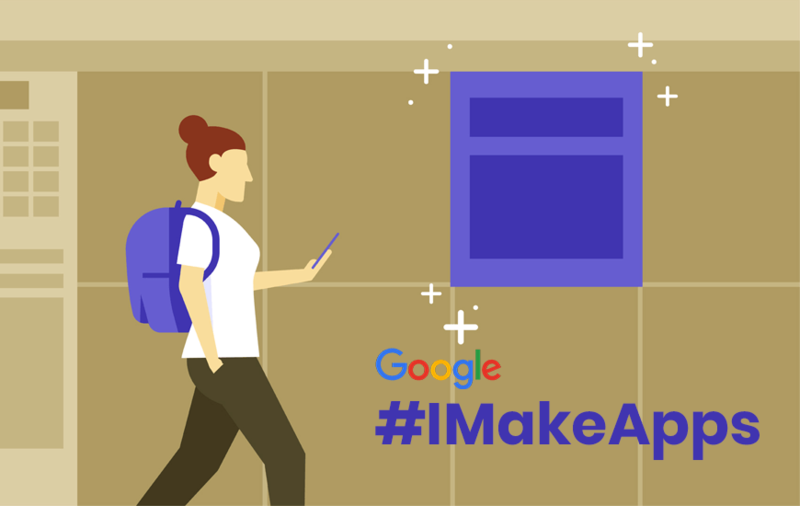 Go ahead and join the #IMakeApps Google campaign and be a storyteller of your own journey. Also, don’t forget to click on that ‘Subscribe’ button so we can bring more such interesting information to you. Will Zero Application Interface dominate the App World?